Hello everyone and welcome back to brand new opportunities of today’s Walmart BeautyBook Flyer March 5 2018! In it, you can find many big deals and discounts on various special products such as New Dove Anti-Dandruff or Love beauty and Planet Shampoo or conditioner. Walmart BeutyBook is all about beauty and personal care, so today is your time for special feelings. Now, let’s find out the best products! As I said, today’s article is all about you and your personal care so these deals are here for make you feel special. You can nourish your hair and glow your skin with Love Beauty and Planet products. Love Beauty and Planet Shampoo, body wash or conditioner is just $8.97 and Sally Hansen’s new beautifier collection is on discount too. CoverGirl Clean Pressed Powder is just $6,97/each and Sally Hansen Complete Salon Manicure Nail Polish or Top Coat is just $7.97. Also on page 5, you can find the Burt’s Bees Nourishing Mascara for just $13.97. These are just the lookups and you can find the whole Walmart BeautyBook Flyer March 5 2018 with the simple click in here. Also, as always, you can see our special shopping list down below. 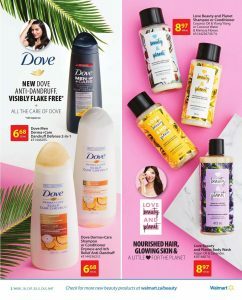 These are the best deals of today’s Walmart BeautyBook Flyer March 5 2018 but you can always find more by just turning the pages. Each page is full of new deals so check them carefully. Also, you can subscribe our news teller for daily alerts on newest flyers and discounts. See you on next deals! FreshCo Flyer February 18 2017 New Savings Every Week! Hello everyone and welcome back to today’s biggest deals on FreshCo Flyer February 18 2017 New Savings Every Week! In it, you can find the best deals on your daily needs such as tomatoes, apples, pears and mandarins. In today’s post, we will talk about the daily needs of your kitchen and how to solve this problem with newest FreshCo Flyer February 18 2017 New Savings Every Week! Every house needs some fundamental items such as vegetables, fruits, snacks and meats and today’s flyer is a perfect match for those needs. Now, let’s talk about today’s deals, shall we? In page 5, you can find the deals focused on meats, seafood, chicken, and turkeys. Best deals on this page are One World Deli Chub 450g, 3.99$, San Daniele Prosciutto, Mastro Charcuterie Trio Sliced or Salametti Chubs for 4.99$ and Northern King Pacific Salmon Steaks Frozen 550g., for 5.99. With this deals, you can save up to the 2.50$ for your every item. Page 6 is focused on vegetables and fruits, so if you need those kinds of products, then this page is just for you. In it, you can find Seedless Cucumbers for .98$, Hothouse Tomatoes for 1.48$/lb. and Bartlett Pears for 1.28$. These are the deals to keep in mind, but let’s check out the other opportunities to save more! Best Deals on FreshCo Flyer February 18 2017 New Savings Every Week! We talked about the deals and now let’s make a shopping list that contains biggest and most needed deals! 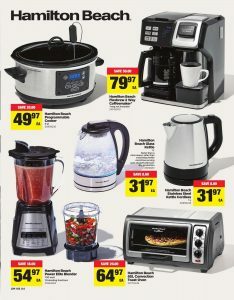 Today’s post and the flyer is all about your kitchen need so feel free to check out all the deals by clicking here. Also, you can always use our shopping lists to check out the deals. Now, let’s see the shopping list! Peaches or Black or Red Plums, 1.88$/lb. These are the musts for FreshCo Flyer February 18 2017 but you can find much more deals in here. Also, feel free to check out our website for countless retailers, discounts and newest flyers. See you on next deal! Christmas is over and we are now in the Boxing Week! Almost all stores in Canada have special offers for this special occasion and Home Depot is no different! Today on Home Depot Flyer Boxing Week Sale December 25 2017 you can find many hot deals with biggest savings. There are many special offers on today’s flyer so be quick and get what you need, while you can! In today’s flyer, you can save big time while shopping for a whole week and get brilliant products such as GE 30” Refrigerator for $998, LG Self Clean Electronic Range with True Convection for $998, Whirlpool Dishwasher for $498 and LG Steam Washer for just $1776 with $520 saving. These savings are big, so you need to check Home Depot Flyer Boxing Week Sale December 25 2017 right now! We sure listed the best deals just for you and you can find those right below! Boxing Week is a special week when it comes to shopping and big savings so if you need any kitchenware, today’s Home Depot Flyer Boxing Week Sale December 25 2017 is just for you. In today’s flyer, you can find many big savings on various kind of products such as refrigerators, dishwashers, electric ranges, steam washers and so on. All of these items are belong to big companies such as LG, Samsung, Whirlpool etc. so you can be sure of their quality and warranty services. Now let’s cut the talk and see the deals! These are the best deals but you can always find more on today’s Home Depot Flyer Boxing Week Sale December 25 2017 with just a simple click in the right-hand side image. Also, you can become our subscriber for more deals and deal alerts on almost every retailer in Canada. See you on next deals! Merry Christmas everyone! On today’s Canadian Tire Flyer Merry Madness Sale December 14 2017 you can find many big discounts on various kinds of products special to this holiday season. In addition to discounts, you can receive a $50 promo card when you spend $200 or more before taxes in-store. Promo cars will valid just from December 15 to 24, so be quick and spend all your promo while you can! With today’s Canadian Tire Flyer Merry Madness Sale December 14 2017 discounts and events, you can save while you are spending! OK now, let’s cut the talk and see the deals! As I said, there are countless deals on today’s Canadian Tire Flyer Merry Madness Sale December 14 2017 and you need to check it all out! We sure listed the best of them but even we can’t keep up with these special discounts for this special occasion. There are countless products worth to check out, so feel free to check them all. Now, let’s see our list! These are the best deals on today’s Merry Madness Sale but there are countless good deals on every page of this flyer. So, do not forget to check out Canadian Tire Flyer Merry Madness Sale for more. Also, please do not forget to subscribe our news teller for daily updates and news about countless retailers in Canada. See you on next deal!